Roy Hill married the girl of his dreams, dotes on his eleven-year-old son, and is next in line for a big promotion in the Atlanta office of a global corporation. Then, almost imperceptibly it all starts to unravel. He is losing control of his life. When his best friend joins a Civil War reenactment group, spending his weekends in camps where the year is forever 1863, Roy finds the idea laughable . . . even though he is the descendent and namesake of a Confederate Civil War hero. But when he visits the regiment just to be polite, something unexpected happens, gradually opening Roy's eyes to the secret of a distant conflict that never ended - and leading him down a path that grows more menacing at every turn. With his job disappearing in a way he could never have foreseen, his whole life slipping out of control, Roy falls deeper and deeper into the Rebel past. A strange and powerful idea takes hold: that his life went wrong long before he was born, in the fateful campaigns that preceded the burning of Atlanta. Among the men, a hard-core splinter group is formed - with Roy at its center. On an ancient battlefield, the once-clear lines between reenactment and reality begin to disappear. When his son is taken hostage is it real? When the old muskets fire will they still fire blanks? Or will a bloody history come stunningly to life? 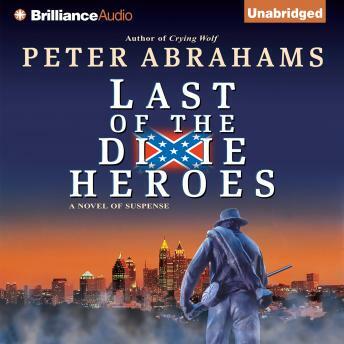 An extraordinary novel about the fate of men and women no longer in step with the rhythms of the modern world, marching back into Southern history to make things right, Last of the Dixie Heroes is Peter Abrahams's most dazzlingly original work yet.